It’s funny to think of him as fruit now that we know there is a little guy in there, but as big and manly as he sounds, he’s still only the size of a peach! 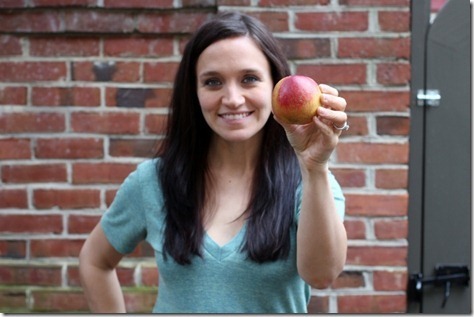 Busted – that’s a nectarine. 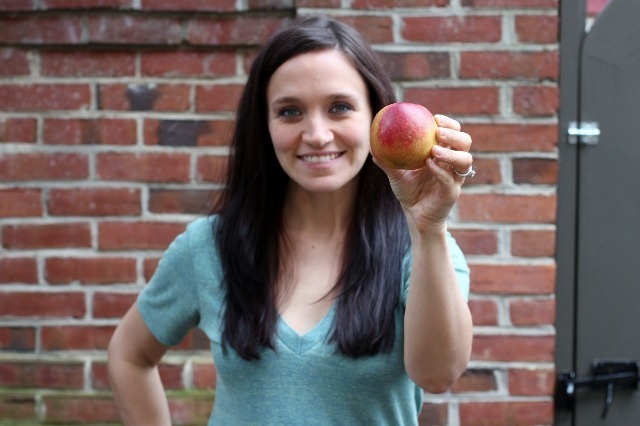 All of these out-of-season produce comparisons are testing my most savvy grocery shopping skills! Saturday morning was the first time I woke up and felt like I really truly looked different. Maybe it’s because I was making a poor choice of wearing horizontal stripes, but I felt like my belly was bulging out and looked gigantic. There is definitely some bump-age happening. Nothing so significant that I would expect anyone else to notice, but my pants (and underwear!) are becoming less and less comfortable. Maternity clothes shopping happens this weekend! Other changes of note: zits. Everywhere. I might as well be on 16 and Pregnant because I am certainly looking the part. Oh, and my nails are hard as ROCKS. I already had really healthy solid nails pre-pregnancy, so now they are as hard as concrete. I’m scared of them. I am happy to report that there have been no more puke-a-thons since last week’s update. There has been nausea, but I can manage that. I wouldn’t say my appetite is even close to being back, but I’m finding I can stomach a few new things here and there. I’m eating a LOT of fruit – mostly strawberries and oranges – and downing ice cold cereal by the bowlful. 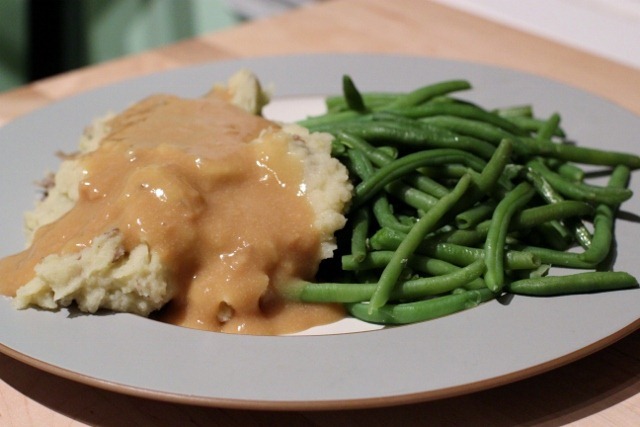 Only one thing could be worth dirtying four pans and a stand mixer for dinner – homemade mashed potatoes with vegan gravy and green beans. Oh my word. I could not have been more excited about this dinner, and I am feeling sad just looking at the pictures and knowing that I already ate all the leftovers. I think I could eat that gravy by itself – it’s that good. I want more. On the eating front, I have noticed that I get reaaaaally full much more quickly than I used to. My pre-pregnant self could shovel in food by the plate full, and now I find myself taking tiny portions that I would have laughed at before. 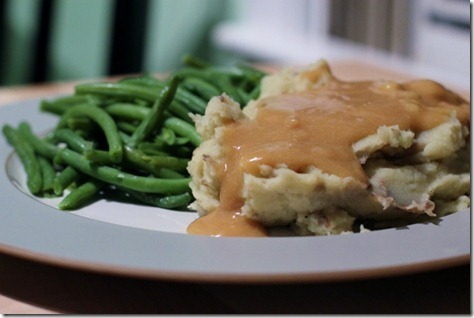 I don’t seem to have the ROOM in my belly that I had before, which leaves me hungry again 30 minutes after dinner. Feeling good this week! I have a little more energy and motivation than last week, which has allowed me to be much more productive recently. I still find that I am out of breath VERY quickly, and have to stop and rest a lot more than usual. The only other thing that happened at our visit yesterday, that I forgot to tell you about since I was so excited about hearing the BOY news, was one little blip of possibly worrisome information. Apparently my placenta (I can’t believe I’m writing about placenta) is “low” – which can result in a condition called placenta previa if it doesn’t move up significantly in the next 27 or so weeks. At the time I was so happy about our ultrasound that this didn’t really phase me. And then this morning I got on Google and started scaring myself to death – reading about the possibilities of bed rest, bleeding to death, and hysterectomies during delivery. I might have done some panicking, and there may have been some crying. I got it out of my system, and I’m going to try to not worry about it until the 20-week appointment, where I will hope and pray to hear that it has migrated north. The other exciting news is that I am back at the gym and exercising again! I have been lifting weights and doing cardio all week, and have promised myself to take at least an hour long walk every day. I think walking is great exercise anytime, but especially during pregnancy. After this morning’s research on the placenta issue, I think I’ve decided to continue to hold off on running for now. I might change my mind down the road, but for right now, it feels risky and unnecessary. I love running, and I plan to do a LOT more of it once my body is ready again. But for now, me and Baby G are going to stick to the low-impact cardio options while we safely journey to October. This little man is so spoiled already! I have actually not bought anything (besides his little cardigan! ), but he is already very loved by friends and family, and got not one but TWO adorable gifts this week. 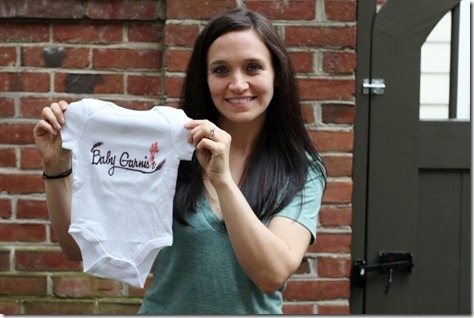 The first came from Florida from my friend Mary Ann – a handmade Baby Garnish logo onesie. Seriously – could this be ANY cuter?? I can’t wait for him to wear it! At least until October! What a ham. Rumor has it that my mother-in-law also has the entire baby boy lineup from Baby Gap en route to her house in Indiana. He is very well loved, and we are so grateful! That’s all for this week! I’m in the process of finding a new doctor and hospital in Seattle so I can get my next appointment scheduled quickly. So much to do before we move! 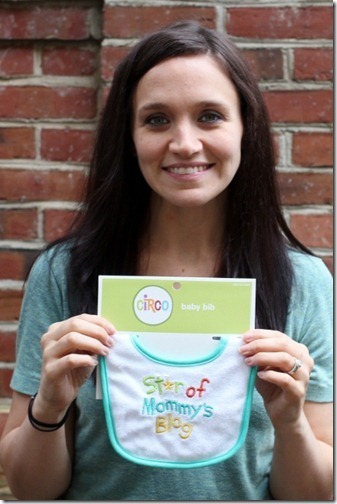 « Previous PostSecond Prenatal Visit Surprises! Next Post » Chocolate Chip Banana Brownies. I’m currently nannying in Seattle (Mercer Island) for a family with three kids, the youngest is ten months. The mother loved her OB/GYN. Shoot me an email if you’d like the contact info for the doctor! You look fantastic! 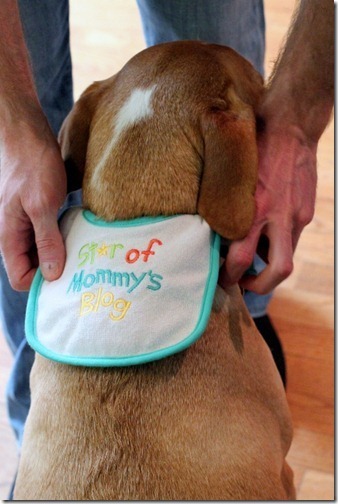 I love that bib- I definitely hope to own one of those some day! Awe too cute! 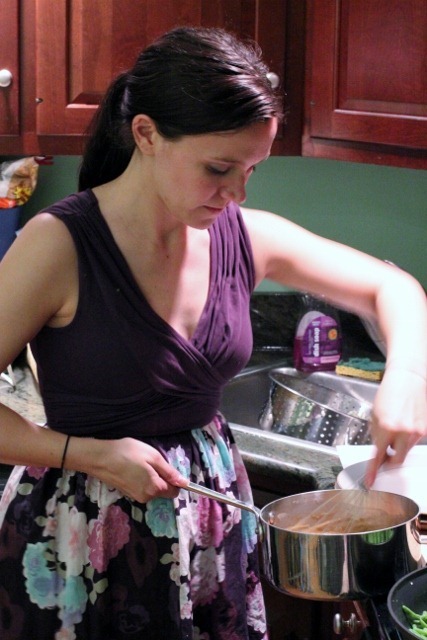 I love your pregnancy updates AND that adorable purple dress you’re wearing while cooking. Hoping your twenty week appointment brings you good news on the placenta front! Glad your feeling better! That baby garnish onesie is too cute! Baby related items seriously make my heart melt!!! I had a low placenta at my 12 week appointment also…don’t worry about it at all! By the next ultrasound, it was right where it should be. I wish they wouldn’t tell us that stuff until it actually is a problem!! Congrats on the boy!I have a 7 month old baby boy and, needless to say, he has stolen my heart! I love the little fruit comparisons! As they get bigger the fruit/veggie comaparisons get funnier! Congratulations again! LOVE these posts! as Bean is getting bigger, it’s so fun to relive these moments! It’s co cliche, but they really do grow up so FAST – he’ll be here before you know it! i’m sure you are already contemplating names now…that’s gotta be the best part! You look so cute! And I am loving all the pregnancy updates. Try not to worry too much about the ‘what if’ factors until your next appointment, which I know is easier said than done. But I am learning that pregnancy is one big ball of ‘what if’ factors. And if you find any luck with treating the pregnancy acne, please please please please let me know. Mine is driving me crazy! The restraint you are showing for shopping is phenomenal. The day I found out I was having a girl I went to Gymboree and spent a ton…I just knew that my baby Caroline would need the strawberry dress, socks, hair clips, and slip on shoes that all match. That bib is fabulous! Too, too funny. I’m so enjoying reading, as usual, but especially with you being willing to share your amazing baby-making journey (my sister-in-law is the one who made me realize the baby-making isn’t over after conception. She used to call me and say things like “I grew eyes today and I’m exhausted!” lol). Wishing you (and your boys =D) the best! 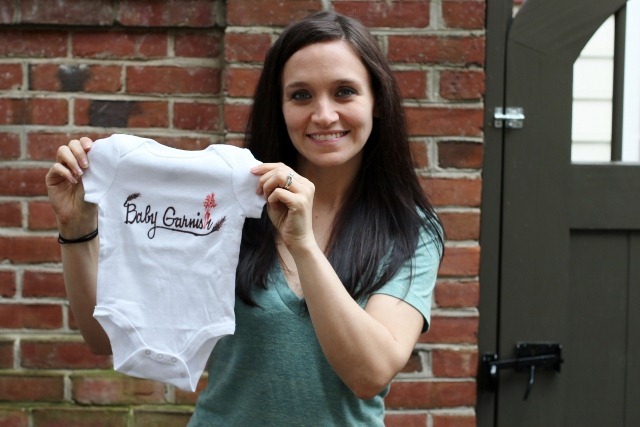 LOVE the onesie and I’m not even thinking about getting pregnant anytime soon but I’m going to find that bib! sooo adorable!! You’re too cute Emily! Hi Emily, I just wanted to let you know that I have been a reader for a long time and always mean to comment but never have. 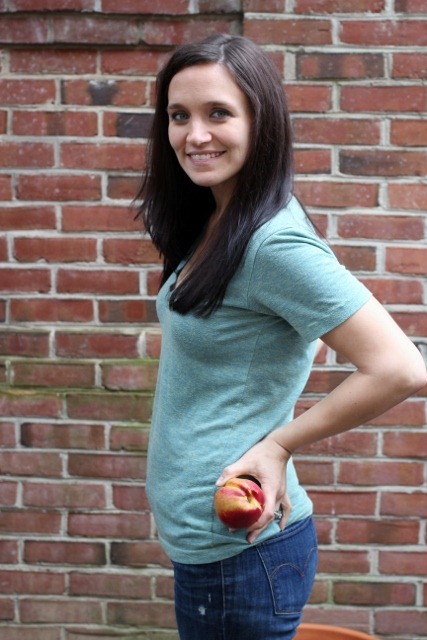 I am loving your pregnancy journey posts because I am also pregnant :-) Due 3 days after you! I screamed when I found out you were pregnant too! I’m so happy for you and Casey and I look forward to continuing to hear how your pregnancy progresses. It is really fun to be able share this journey with someone, even if it is online! I also love hearing about a fellow vegetarians journey to motherhood. Thank you for sharing these posts! Oooooh congrats to YOU!! How FUN!! Thanks! You too! I have to say we are having opposite experiences so far it seems… I haven’t been sick at all and I am definitely showing. I have been asked many times if I am having twins (I am not!) because my belly has gotten so big so early. None of my pants fit! 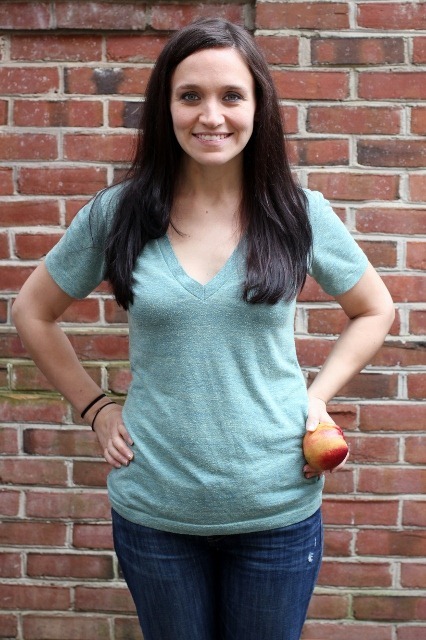 I do totally recommend the Be Band if you are shopping this weekend for new clothes – they sell it at target and I have been able to keep wearing all of my pre-pregnancy pants unbuttoned with the band over the top and it has been working really well! Just got a Be Band – I haven’t worn it yet though! I love the pregnancy updates- you look beautiful and so happy. As for a new doc when you head to Seattle, have you considered seeing a midwife instead? Even with a low-lying placenta, you are not considered high risk, and seeing a midwife would help facilitate a natural, normal labor and delivery. 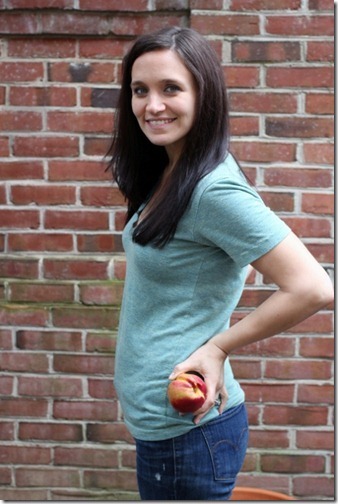 You are so health-conscious, I would imagine you would lean toward a more natural birth. I am seeing a midwife in Seattle. :) Still working on developing a birth plan and options. I am very interested in natural birth, but I also need to factor in my history with anxiety, which I know will be very present in the delivery room. I want to set myself up for success as much as possible! 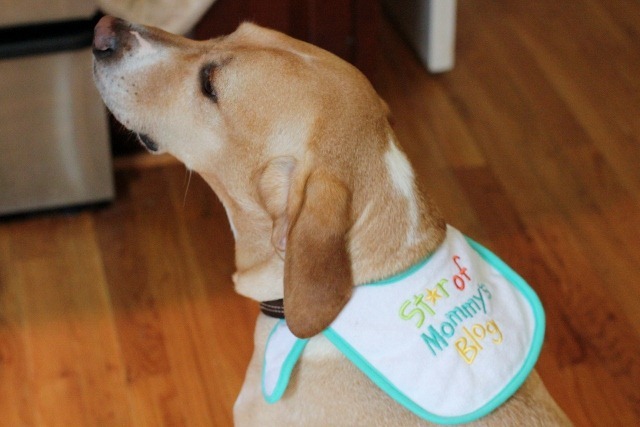 I just came across your blog and am so excited to find it. At times I feel like I’m reading a blog about myself – your thoughts, worries and anxieties reassure me that I’m not a crazy person. Thank you! Hi Emily, I just had to write to tell you that I had placenta previa with my first baby (who is now 12!). I was able to be very active the entire pregnancy. There was no bedrest- nothing special except extra ultrasounds (which was fun!). It sounds so scary at first, but it is just something good to know that they can keep an eye on! Your ultrasound pictures were amazing! Take care! Thank you – that is really reassuring! Emily, you have so so SO much to look forward to. I can’t even begin to tell you. Take care – he’ll be here before you know it! Cold cereal is the best! I am so excited about having a little boy. :) I just want him to hurry up and get here!! 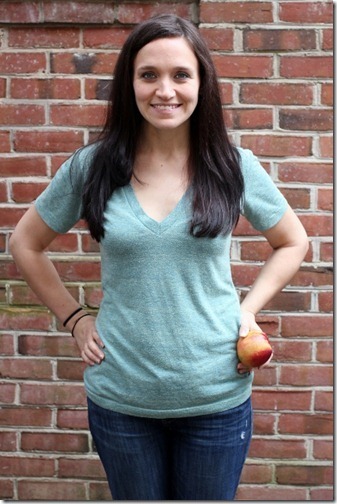 A couple of things … don’t be disappointed if you find that maternity clothes don’t fit you yet. You are teeny-tiny, and you look like you could get away with leggings and a one-size-up, floaty top for another couple of months. 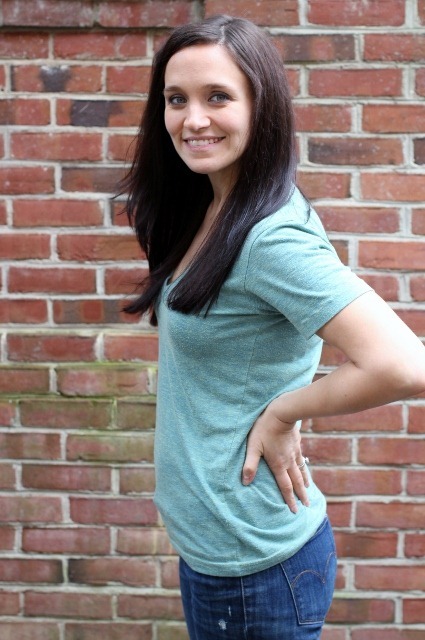 It *is* fun to shop for maternity stuff … but some of it just doesn’t work in the early months. I recently moved back to cincinnati from seattle and started reading your blog by a recommendation from my sister in law. We used Dr Susan Block and loved her!